ESSENTIAL "Who the Hell Am I?" Some bands survive by reinventing themselves, others by sticking to what they do best. Hoobastank tips toward the latter with its fourth album, "For(n)ever." This latest effort from the ill-named active-rock workhorse rekindles all the elements that made the band's first two albums smash hits, eschewing the tinkering that led to a frosty reception for its third album. On "For(n)ever," Hoobastank settles into a niche and makes no apology for it; the music is inevitably catchy, profoundly uncomplicated, and easily accessible. Working again with producer Howard Benson, who has an intuitive feel for the clean sound and jittery attitude of modern rock, the band has compressed 11 songs into little more than a half-hour, with every note meticulously placed. Doug Robb's ability to cover a vocal range from agitated yelp to smooth plea, and guitarist Dan Estrin's utilitarian approach to serving a song's needs are the bedrocks to Hoobastank's everyman appeal. Though compact, "For(n)ever" hits many key notes. Hard-charging empowerment rockers "My Turn" and "Who the Hell Am I?" evoke Hoobastank's breakout hit, "Crawling in the Dark"; softer prom-ready interludes such as "You're the One" and "So Close, So Far" are clearly meant to reflect the luster of the 2004 Grammy-nominated song "The Reason." 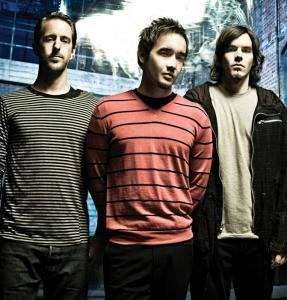 Hoobastank plays Feb. 23 at the House of Blues in Boston.